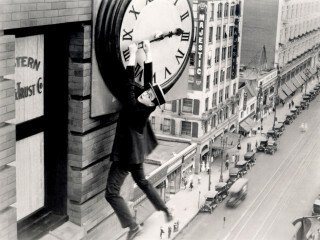 Harold Lloyd stars in this hilarious film about a department store grunt turned unwilling daredevil. Lloyd used numerous buildings in downtown Los Angeles to shoot the film’s climactic building ascent. Even after maiming a hand in a previous bomb stunt mishap, Lloyd performed most of his own stunts. Doubles, including a circus performer, were used for a handful of shots in Safety Last.